You can use custom scorecard transforms in PerformancePoint Services in Microsoft SharePoint Server 2010 to change the appearance and content of scorecards. Transforms are especially useful for making global changes to a collection of published scorecards, without requiring you to edit scorecards individually in PerformancePoint Dashboard Designer. Although transforms run on all scorecards throughout a PerformancePoint Services instance, you can set conditions so that only specific scorecards are changed. This article contains instructions for creating and installing a transform. The code example is written in the C# programming language and uses the Microsoft .NET Framework 3.5. You can paste the code into Microsoft Visual Studio and then edit as needed to make it work with your environment. This example is intended for demonstration only. It is provided AS IS without warranty of any kind, either express or implied. This includes any implied warranties of fitness for a particular purpose, merchantability, or non-infringement. Suppose that you have created a PerformancePoint dashboard that contains a scorecard and several reports. For example, a basic dashboard that can be used to track inventory might resemble the following image. 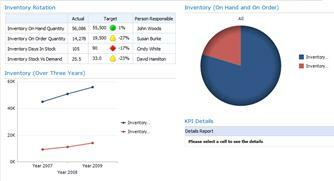 The dashboard displays the correct information, but with other reports on the page, it might be better to make the Inventory Rotation scorecard appear more concise. Suppose additionally that there are several other dashboards that contain various inventory scorecards, and that you want to reduce how all the scorecards are displayed. Rather than edit each one by using Dashboard Designer, you can create and apply a scorecard transform that displays how all those scorecards are displayed without actually changing the scorecards. Changes the background color of the Actual column cells to reflect the indicator color. Removes all columns that are not Actual column types. You can use your own PerformancePoint dashboard or re-create our example dashboard. For information about how to create a dashboard that resembles our example dashboard, see Create a baseline PerformancePoint dashboard to use with custom extensions scenarios. Identify or create a PerformancePoint dashboard that contains a scorecard that resembles the scorecard that is shown in the following image. The scorecard contains key performance indicator (KPI) names on rows. The scorecard contains only one Actual column. The scorecard contains a Target column that uses an indicator that has three bands: On Target, Slightly Off Target, and Off Target. To create the transform, you must have Visual Studio installed on the application server where PerformancePoint Services is installed. To download trial versions of Visual Studio, see Visual Studio Downloads (http://go.microsoft.com/fwlink/p/?LinkId=220177). To install the transform, you must have sufficient permissions to register an assembly in the global assembly cache, copy files to the local directory, and edit the PerformancePoint Services Web.config file. In addition, you may need permissions to recycle the Internet Information Services (IIS) application pool that the transform worker process is running in. To create our example dashboard, see Create a baseline PerformancePoint dashboard to use with custom extensions scenarios. The following instructions are based on the assumption that Visual Studio is installed on the application server that is running PerformancePoint Services. These instructions are based on the Visual Studio 2010 Professional user interface. They might vary in other versions. Create a folder named to store local copies of PerformancePoint Services assemblies. These instructions assume that you create a folder named PpsDlls on the root of the C drive. Start the command prompt console as an administrator. In Visual Studio, click New, and then select Project. In the New Project dialog box, select the Visual C# template, .NET Framework 3.5., and the Class Library project template. Type ShrinkScorecardTransform as the name for the project, and then click OK. Replace the boilerplate contents of the class by using the following code. // PreRender scorecard transform sample. // Set the transform type, which defines when the transform runs. // Return the string identifier of your transform. // Verify that viewData is not null. // This transform runs only on scorecards that contain the specified string in their names. // Edit 1. Change the string value to test on your own scorecards. // Loop through the row headers. // Abbreviate KPI display names. // Replace strings in row headers with abbreviations. // Edit 2. Change the string values to test on your own scorecards. // Create containers to store actual cell coordinates. // Loop through the column headers to reformat the actual cell. // Get the scorecard cell at the intersection of the current row and column headers. // If this is an actual cell, store its coordinates. // display elements, such as a target value, an indicator icon, and a variance value. // Look for the default Text values for a native tri-state indicator. // Reformat the actual cell. // Remove columns that are not Actual columns. Change the string variable "Inventory" to match the name of the scorecards that you want to run the transform on. For example, if you want the transform to run on all scorecards with "South" in their names, replace "Inventory" with "South". Change the string variables to match parts of KPI names that you want to abbreviate. In the Solution Explorer pane (located on the right side of the Visual Studio application), rename the Class1.cs class to ShrinkScorecardTransform.cs. Right-click the project node, and then select Add Reference. In the Add Reference dialog box, click the Browse tab, and then navigate to the C:\PpsDlls folder. Select the two assemblies that you copied in the "To copy PerformancePoint Services assemblies from the global assembly cache" procedure, and then click OK. Reopen the Add Reference dialog box, and then click the .NET tab. Select the System.Drawing assembly, and then click OK. In Solution Explorer, right-click the project node, and then select Properties. Click the Signing tab, and then select the Sign the assembly check box. In the Choose a strong name key file list, select New to generate a new key. In the Create Strong Name Key dialog box, type the name that you want to use for the key. (Optional) Provide a password for the key. In the Solution Explorer pane, right-click the project node, and then select Build. The build status displays in the lower-left-hand corner of the Visual Studio application. If the build fails, refer to the Error tab for troubleshooting information. Using Windows Explorer, navigate to the output folder that contains your transform assembly. By default, it is created in the bin\Debug or bin\Release folder in your Visual Studio project files. Example: C:\Users\mboyer\Documents\Visual Studio 2010\Projects\ShrinkScorecardTransform\ShrinkScorecardTransform\bin\Debug. Open a separate instance of Windows Explorer, and then navigate to the global assembly cache in the default path C:\Windows\assembly. Drag your transform assembly to the global assembly cache. If you cannot add the assembly to the global assembly cache, close the two instances of Windows Explorer, reopen them with administrative privileges, and then repeat steps 1a and 1b. In the global assembly cache, right-click your transform assembly, and then click Properties. In the Properties dialog box, find the version, culture, and public key token of the assembly. Make a record of these values. This procedure describes one way to register an assembly in the global assembly cache. For information about other ways to register assemblies, see How to: Install an Assembly into the Global Assembly Cache (http://go.microsoft.com/fwlink/p/?LinkId=220181). Navigate to the PerformancePoint Services Web.config file in the default path %PROGRAMFILES%\Microsoft Office Servers\14.0\WebServices\PpsMonitoringServer. As a best practice, make a copy of the Web.config file before editing it. Find the opening tag for the CustomViewTransforms element, and then paste the following code directly under it. The transform is now applied to new and existing scorecards (and Strategy Map reports) that are in your environment. If the scorecard views are cached, you may not see the transform changes. In this case, you can recycle the Internet Information Services (IIS) application pool for PerformancePoint Services that the transform process is running in and then refresh the dashboard page. In the Windows Start menu, select Run. In the Run dialog box, type inetmgr and then click OK. In Internet Information Services (IIS) Manager, expand the server node, and then click Application Pools. Right-click an application pool name, and then select View Applications. The target application pool is the frequently the one that is running the most applications, as shown in the Applications column. In the Applications pane, expand the Physical Path column and look for the path that ends with "PpsMonitoringServer." If the list does not contain the path for "PpsMonitoringServer," click Remove filter to return the list of all applications. Note the application pool name that is listed in the respective Application Pool column. In the Application Pools pane, right-click the target application pool, and then select Recycle. Refresh the dashboard page in your browser.